The city of Longueuil is overseeing the construction of a vast retention pond destined to serve a residential neighborhood located in the heart of the VertUrbain project. A retention pond is a zone destined to retain rain water and created to meet urban design needs. It serves as a buffer zone that allows homogenous distribution of the rain water volume in the environment and towards the storm sewer system, according to capacity. Group Rousseau-Lefe bvre is in charge of planning and developing this wetland in urban territory. The group will create a pond that will simultaneously be used for retention and filtration. The pond will also serve as a wildlife habitat, a new urban landscape and a stimulating living environment. The image created by the ponds, as seen from the sky, is a huge leaf, which ribs and lobes will change in shape depending on the water levels. The project, as seen from the sky or from the belvedere, is impressive in regards to its dimensions and its amusing layout. Group Rousseau-Lefebvre asked Quattro Lighting to develop the customised lighting system for this project. 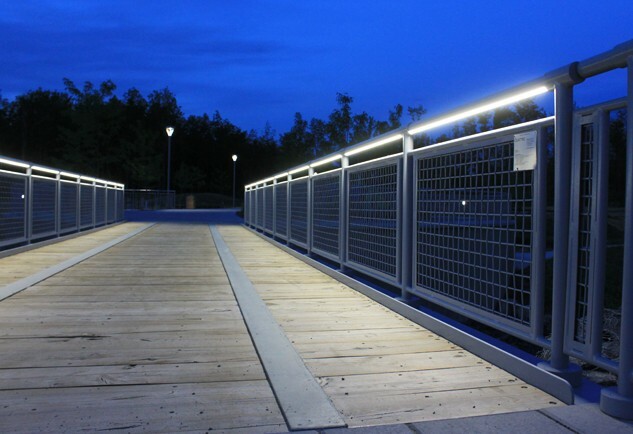 The lighting system has to ensure the safety of pedestrians on the footbridge and trails, as well as in the play and rest areas. The lighting system also has to blend in harmoniously with the urban furniture in place, be discrete and safe, and offer minimalist lighting. The footbridge has to connect the main trail to the central belvedere and ensure a pedestrian link that is well lighted and accessible to maintenance vehicles. The railing, the footbridge, the decorative stormwater management access portail, the luminous bollards, the non-luminous bollards and the lampposts all have to be made of aluminum, which will be painted to match the urban furniture. The lighting has to provide a feeling of safety, all the while respecting the amusing and peaceful nature of the environment. Quattro Lighting was chosen as a partner in this project in order to develop the footbridge, the luminous railing, the tree frames and the decorative stormwater management access portail, as well as to develop the decorative and functional lighting system. Photometric studies, proof drawings and samples have to be presented to the decision making people: architects, city representatives and contractor. The main challenge resides in the development and the manufacturing of the passable footbridge and the luminous railing surrounding the belvedere and the trails bordering the pond. 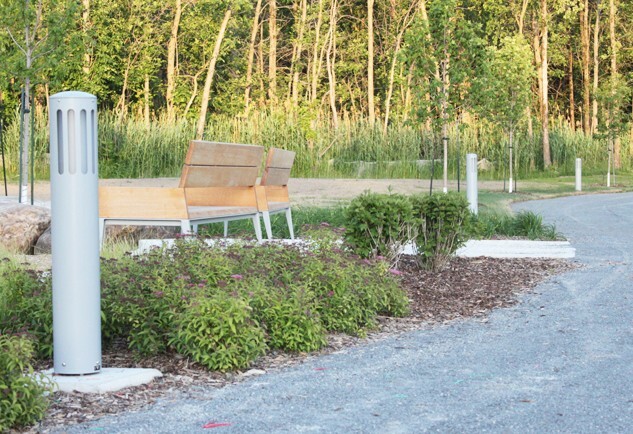 The play and rest areas will be illuminated by bollards and conventional deco-functional lampposts. The footbridge has to respect 49.2’ x 10.8’ measurements and have the capacity to support the weight of a tank truck (used for the maintenance of the ponds) or service vehicles (for the park). The footbridge is the center of the layout and represents an important element within the infrastructures; it has to present a high level of architectural quality, aesthetics and finish. The aluminum railing has to include a luminous handrail and a grilling. Its use has to be safe for children. Is also has to be fixed to the ground in an aesthetic and efficient way, considering the fact that it has to attach on steel and pavement. The railing around the belvedere has to follow the circular shape and therefore be bent to a radius of 10 m (32.8’). The lampposts and bollards have to use LEDs and have to match the urban furniture by their contemporary design and their colors in order to dress the space and embellish the landscape without crowding it. The challenge is substantial and the lighting project has to add value to the environment. Developing the product with the client and managing the project cannot be achieved without a deep knowledge of the environment, people, technology, materials and architecture. All in order to ensure a safe, comfortable and attractive urban atmosphere. This project falls precisely within Quattro’s field of expertise. Preparatory meetings were held, involving representatives of the city of Longueuil, the architectural firm Group Rousseau-Lefebvre, the contractor Excavation CivilPro and the engineering supervisor SNC-Lavalin. The purpose of these meetings was to understand and define the objectives, needs and requirements of all the parties in order to ensure the balance between performance, comfort, efficiency, architectural integration and ease of installation. Two main steel beams W21x 68 (W530x 101 kg/m) and secondary beams W8x21 (W200x31 kg/m), as well as adequate bracing were selected and welded according to the CSAW47.2 norm in order to withstand loads of use and to keep the maximal flex under the L/360 limit. Galvanised and painted, the structure of the footbridge will be efficient and aesthetic. The deck of the footbridge is made of hemlock beams (75 x 200 x 3048 mm). The beams were bleached and treated to counter the effects of UV rays. A galvanized steel tread protects the wood decking from the snow removal equipment. The luminous railing is manufactured and preassembled at the factory in portions of 4.5 m (consisting of three sections). The vertical posts and the handrails are made of round sections (60 mm in diameter), incorporating LED flexible tape and serving as conduits for the power cables. The aluminum grids are made of 6 mm rods that have 50 mm mesh and are welded to the frames and the 33 mm diameter support tubes. The decorative A356 aluminum base was specially developed and is closed with two lids, ensuring easy installation on the anchor bolts and an aesthetic finish. The railing portions are mechanically assembled by discrete stainless steel locking screws. The curved portions for the belvedere were arched one by one before final assembly. Careful attention was paid to the quality of the finish before the application of the polyester powder paint matching urban furniture (RAL7040 color). The linear LED source used is a flexible tape that is very efficient when used for projects where an intense source is required. The tape, with its IP67 waterproof silicone sheath, is designed to provide very little space between each LED, which gives a continuous lighting effect similar to the effect of a fluorescent tube. It is composed of 120 LEDs per meter, with a light output of 880 lumens per meter at a color temperature of 5000 K. The LEDs are supplied with 12 VDC to ensure user safety. The light source is encapsulated behind a lens and integrated into the handrail, which is a section made of extruded aluminum that was specially developed for this project. The luminous handrail sections (1500 mm long) are mechanically attached to each post to allow maintenance. The photometric studies conclude that the LED tape should be oriented at 30 degrees inward from vertical in order to ensure homogenous lighting on the footbridge and minimal light pollution to the ponds. 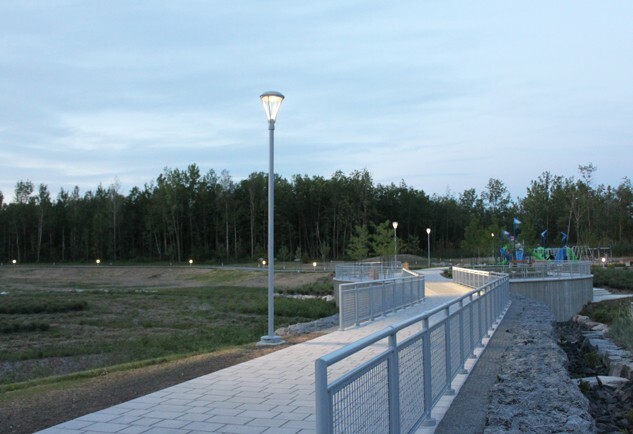 The lighting system for the trails and the play and rest areas is developed using deco-functional lampposts and bollards. Twenty-four luminous bollards and five LED lampposts are required to ensure a safe and peaceful lighting. A lamppost from the TERRA series is selected for its contemporary look. The TER200 is made of a housing, a frame and a decorative base with four arms made of cast aluminum. It has a sturdy roof made of spun aluminum. The push button opening system provides hand-free and tool-free access to internal components in order to allow easy maintenance. The product comes with a tempered glass lens (flat or convex). However, with a LED device, there is no need for a lens, because the module is IP66. The optical module installed in the TER200 is cut-off of Type 5 and uses a LED device of 48 Watts of power. The optical system uses 120-277 V. The electronic power supply includes 28 LEDs and provides a color rendering index of 70 (CRI) and 3862 lumens (80 lumens / watt) with a color temperature of 4100 K. All components are CSA / UL. The selected bollard is from the MIS906 series. The aluminum post (6 5/8″Ø x 0.134”/SCH10 thickness) is mechanically mounted to the steel anchor plate. The cap is made of cast aluminum. The light source consists of LEDs (25 Watts of power) and is protected by a brushed acrylic lens (GAB). The bollard has a CRI of 80, 2500 lumens of brightness and a color temperature of 4100 K. All electrical connections use removable polarized plugs. All components are CSA / ULC. The project for the Parc des Semis was a great challenge: new product development, phasing and coordination of the project, expected finish quality, numerous different elements and imposing size. Quattro managed to deliver, not only products according to customer expectations, but an integrated project that is consistent and of high quality. Quattro knows light and all related technologies. We provide a unique signature to each development project in which we are involved by adapting to the technical requirements and imagination of our customers in order to find viable and sustainable customized solutions. Quattro’s lighting products are a guarantee of success.